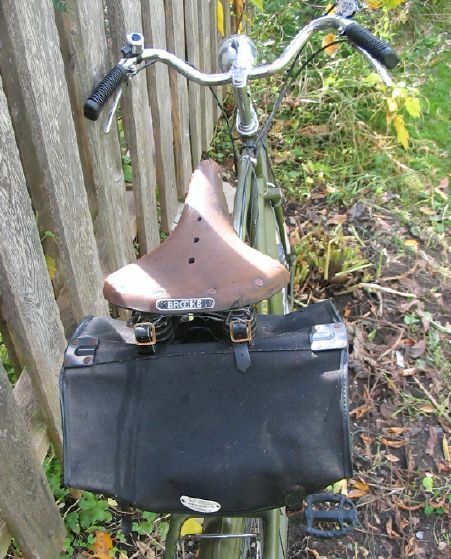 I started reading up on old British bikes after acquiring my Raleigh Twenty folder, with a good helping of my info coming (as usual) from Sheldon Brown's website. I came to appreciate the fact that although these bikes are now regarded as old-fashioned by most, I like to think that they have this air of dignified sturdiness to them. I had previously owned a Raleigh Sports, but at that time I had too many bikes and not enough space for all of them! So the bike got donated back to the re-Cycles bike co-op from whence it came (and where I volunteer). I always wanted to have another 3-speed Raleigh, and got my chance a month ago when a woman came into McCrank's Cycles where I work part-time. She had two Superbes, one a 23" frame, and the other a 21". She asked that we move the nice Brooks saddle and original Raleigh pedals from the 23" bike (which she had bought new here in Ottawa in 1971!) over to the 21" (which she had picked up two weeks previously at a local garage sale) and also give the smaller one a tune-up. I asked her what she was going to do with the bikes, and she said that the smaller one was being given to a friend. "And the larger one?" I asked, "oh, perhaps you could take that in trade for the labour?" she inquired. I checked with Peter (my boss) and he was fine with it as long as it didn't cost him any money! 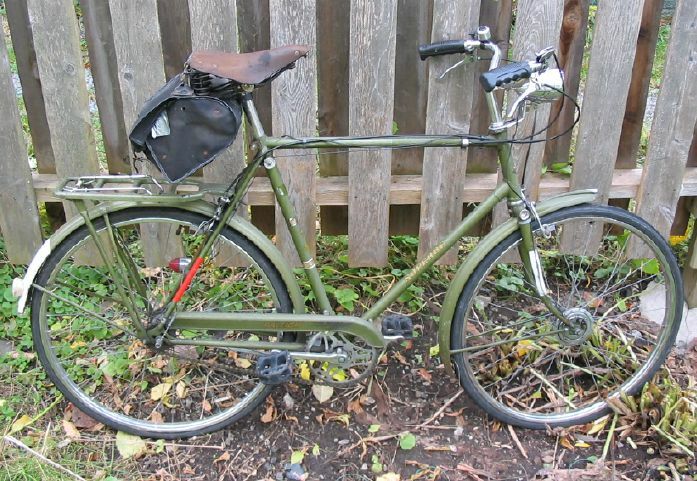 So I did the work, paid for the job, and a lovely, one-owner Superbe, with working front Dyno-hub and lights and original stamped-steel rear rack, was mine for $40. The gearing on these old 3-speeds is rather high, and Sheldon puts it at 50, 66, and 89 gear inches with the stock gearing (44/18). Now I know why most of the people I've seen riding these bikes didn't have a very high pedaling cadence... I wanted to get my cadence up closer to what I'm used to, so I did the same thing as I did to the Sports, and replaced the stock 18 tooth sprocket with a 20 to get the ratio down a bit. As it is, I mainly cruise in 2nd gear, with 1st being used for uphill and 3rd for downhill (wow, perhaps this was just what the designers intended! [grin]) . The only alterations I've done were to put in a longer seatpost (my legs are too long for the original one), and to add more comfy handgrips (very nice reproduction ones, acquired from Sheldon Brown). These bikes were sold for almost six decades, and were originaly built for the British working class (and that included Raleigh employees) to get to their jobs over less than ideal roads and through rainy English weather. So fenders, internal hub gears (and even internal hub generator lights, which the Superbe has) were standard. The stock steel wheels of course don't stop very well when wet, so modern commuters would do well do have alloy rims (at least on the front) built up for these bikes. What I like about this bike is that it feels like it'll ride over anything. The frame seems very strong (and a tad heavy), and as I hit the cracks, bumps and holes of urban riding the 65 psi tires and mattress saddle smooth things out somewhat. The bumps aren't nearly as jolting as when I'm on my hybrid bike, though the hybrid is of course faster due to its lighter weight and 100 psi tires. I like to use the Superbe for short hops, and since Ottawa is a fairly flat city for the most part, the three speeds of the Sturmey-Archer AW hub are just fine for what I ask this bike to do. I don't think I'd want to ride this thing across the country, but then again, I wouldn't want to ride any upright bike any long distance at all - that's what I have the recumbent for! To borrow from Sheldon Brown's page: "Don't sneer at old 3-speeds. They are serious bikes, built for serious use. They are meant for utilitarian cyclists, and they are still extremely appropriate for riders who don't usually go more than a few miles at a time. They are particularly at home in stop-and-go traffic, because they can be shifted even while stopped. Their English heritage: full fenders, oil lubrication, and totally enclosed gear system makes them relatively impervious to wet conditions. They may be heavy, but that is not because they were built to be cheap, but because they were built to endure extremely rough usage and neglect. Properly cared for, they will outlast us all." Copyright 2006 Mark Rehder; Ottawa, Ontario, Canada.